I’ve just downloaded LiquidText from the App Store and already I have found it useful and fun. 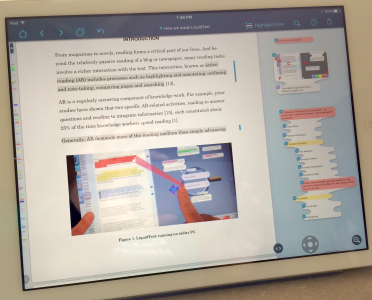 Liquid Text uses active reading technology, allowing you to highlight, annotate, outline and take notes quickly. Pages can be compared and searched easily. Using gestures highlighted text can be dragged to the sidebar or pages can be compared by pinching them together. Find more information here.